eCite - The Consumer Insurance (Disclosure and Representations) Act 2012: not a model for Hong Kong! 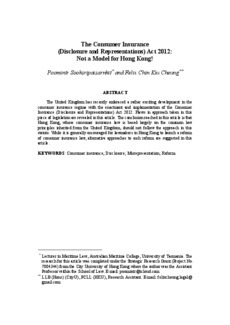 The Consumer Insurance (Disclosure and Representations) Act 2012: not a model for Hong Kong! The United Kingdom has recently embraced a rather exciting development in the consumer insurance regime with the enactment and implementation of the Consumer Insurance (Disclosure and Representations) Act 2012. Flaws in approach taken in this piece of legislation are revealed in this article. The conclusion reached in this article is that Hong Kong, whose consumer insurance law is based largely on the common law principles inherited from the United Kingdom, should not follow the approach in this statute. While it is generally encouraged for lawmakers in Hong Kong to launch a reform of consumer insurance law, alternative approaches to such reform are suggested in this article.